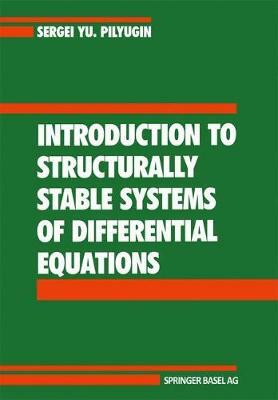 This book is based on a one year course of lectures on structural sta- bility of differential equations which the author has given for the past several years at the Department of Mathematics and Mechanics at the University of Leningrad. The theory of structural stability has been developed intensively over the last 25 years. This theory is now a vast domain of mathematics, having close relations to the classical qualitative theory of differential equations, to differential topology, and to the analysis on manifolds. Evidently it is impossible to present a complete and detailed account of all fundamental results of the theory during a one year course. So the purpose of the course of lectures (and also the purpose of this book) was more modest. The author was going to give an introduction to the language of the theory of structural stability, to formulate its principal results, and to introduce the students (and also the readers of the book) to some of the main methods of this theory. One can select two principal aspects of modern theory of structural stability (of course there are some conventions attached to this state- ment). The first one, let us call it the "geometric" aspect, deals mainly with the description of the picture of trajectories of a system; and the second, let us say the "analytic" one, has in its centre the method for solving functional equations to find invariant manifolds, conjugating homeomorphisms, and so forth.